For Jews during the Holocaust, there wasn’t much reprieve from the despair and horror surrounding them, but music – particularly that of violins, which hold an important role in Jewish culture – offered temporary solace and a glimmer of humanity. 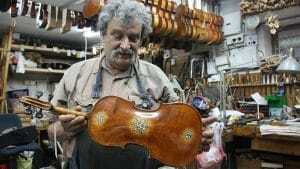 Narrated by Adrien Brody (The Pianist, Grand Budapest Hotel), Violins of Hope: Strings of the Holocaust follows the journey of Israeli violinmaker Amnon Weinstein in his efforts to restore violins recovered from the Holocaust, and captures the lessons and highlights the music the instruments now bring to others. These special artifacts from the Holocaust, which Weinstein has dubbed the “Violins of Hope,” include instruments that were played by Jewish prisoners in concentration camps and others that belonged to the Klezmer musical culture. The program chronicles the journey of the instruments from Weinstein’s small workshop in Tel Aviv, Israel, to Cleveland, where they were brought in 2015. During this U.S. visit, the violins were on display for the community as part of a traveling exhibit, used as teaching tools in classrooms, and played by music students and orchestras. On CPTV: Monday, December 18, 2017 at 10 p.m.